Hello to all Moda Bake Shop readers! 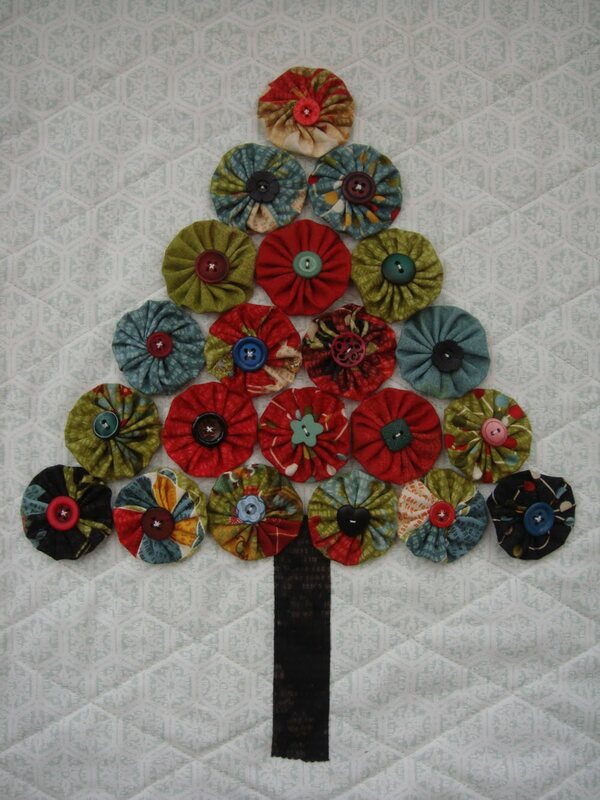 My name is Karin and I am the owner of Quilters Haven UK. I also write quilting books. This yo-yo Christmas tree was originally a project I designed and taught on a Northern Lights quilting cruise, sailing along the coast of Norway, and organised by www.arenatravel.com. Thanks go to Sharon (one of the quilters on the tour) who had the idea of adding presents to the tree. By the way… over here in the UK, yo-yo’s are called Suffolk Puffs. Maybe they originally came from Suffolk, the county where my shop is situated? I like to think so! Quilters Haven is in a 650 year old pre-Tudor building. Do go and take a look www.quilters-haven.co.uk. I hope you will enjoy my first Bake Shop pattern. 12″ square Steam a Seam 2 (no sew applique fusible) Read the instructions before using. Snowflake buttons to embellish the background. 1. Choose 21 charm squares. Make 21 yo-yo’s using the large yo-yo maker, following the instructions in the packet. Sew with a strong quilting thread, knot and leave at least a 10″ tail of thread for attaching a button and sewing to the background fabric. 2. 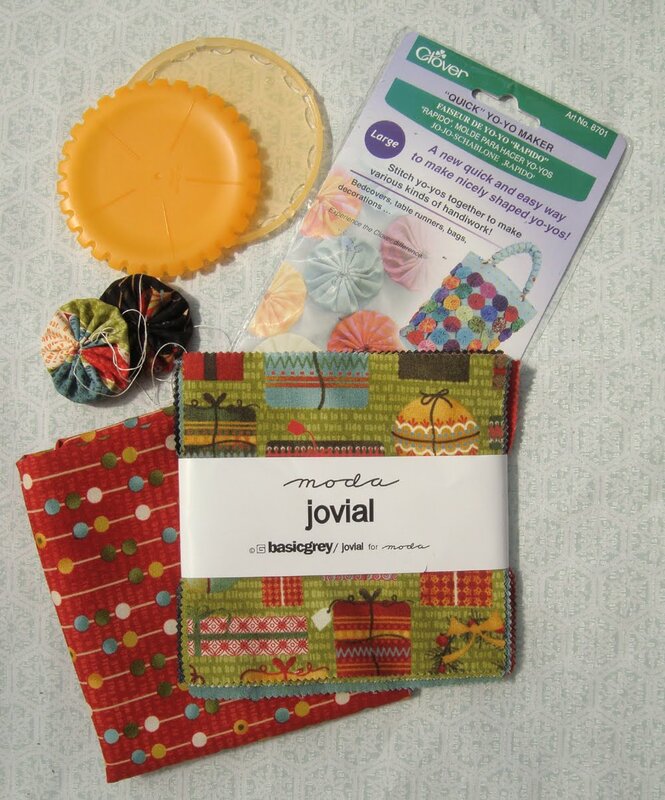 Pin the background fabric Jovial 30266 – 12, right side up on top of the batting. Quilt a crosshatch design using the lines of the hexagon background print as a guide for quilting lines. 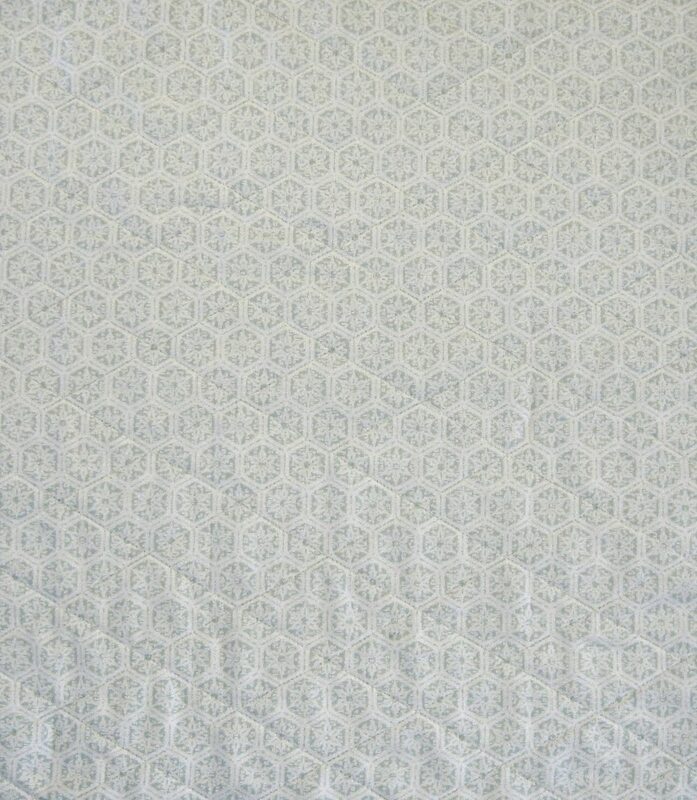 Don’t you think this fabric is wonderful for straight-line quilting? The King Tut thread I chose matches the fabric well, but you could go for a lighter or darker shade. I like this variegated thread as it is ‘forgiving’ if I have a wobble in my machine quilting. After quilting, trim away any excess batting. 3. Stitch the first yo-yo in place with a button on top of the ‘gathered hole’. The first yo-yo edge is about 3″ below the top of the background. Do check it is central. Arrange the remaining yo-yo’s in rows, pinning well, before stitching each time with a button and attaching to the background fabric. 4. Choose a dark tree trunk fabric from the charm pack. Cut a 2“ x 5“ piece and turn under raw edges. Appliqué in position. Alternatively, you can choose to fuse it into position using Steam a Seam 2. 5. 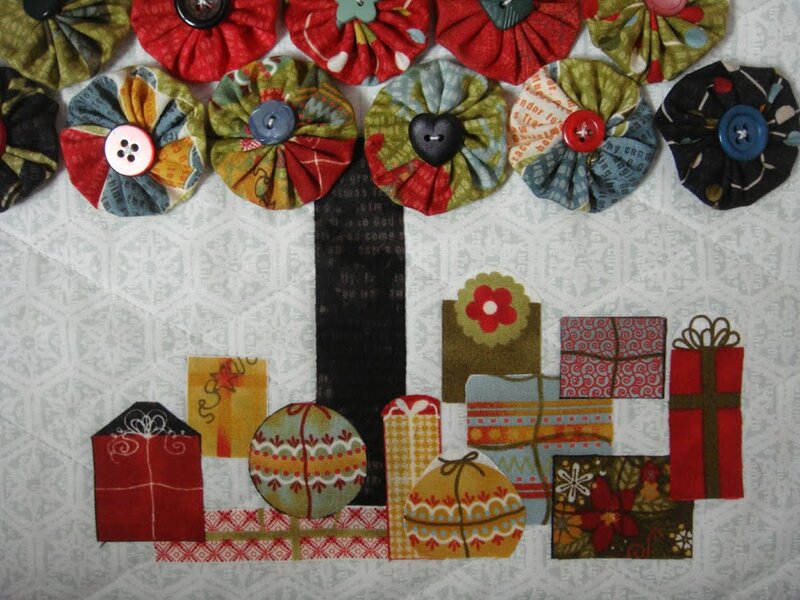 Press the ‘presents’ charm squares to one side of the Steam a seam 2 fusible. 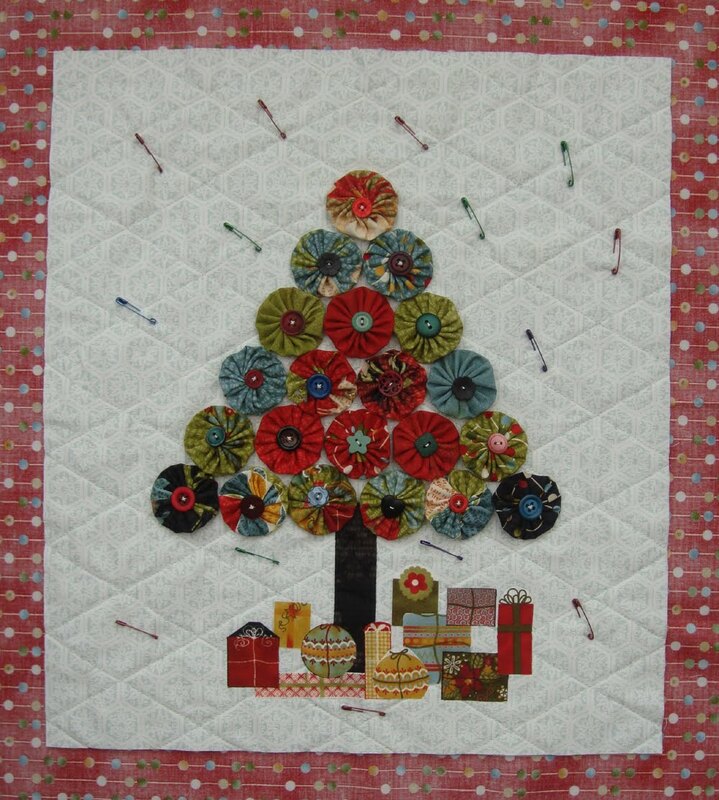 Cut out presents and arrange under the tree. Bond into position. 6. Layer the backing and top. Baste together, I like to use safety pins. 7. 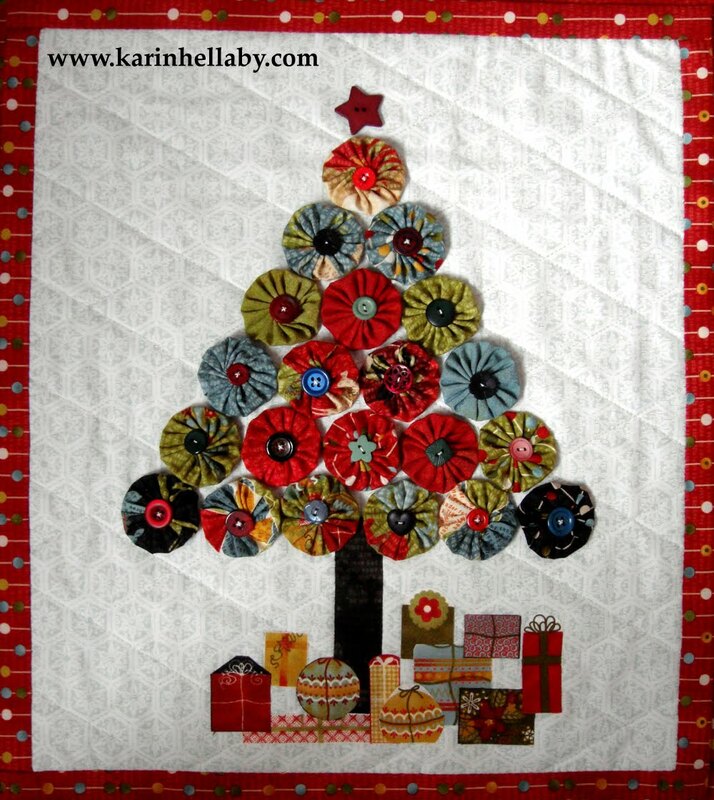 Trim away the backing 1½” away from the outside edges of the quilted tree background. 8. Fold the backing fabric over twice to form a ½” binding for the quilt. Stitch in place on the front of the quilt. 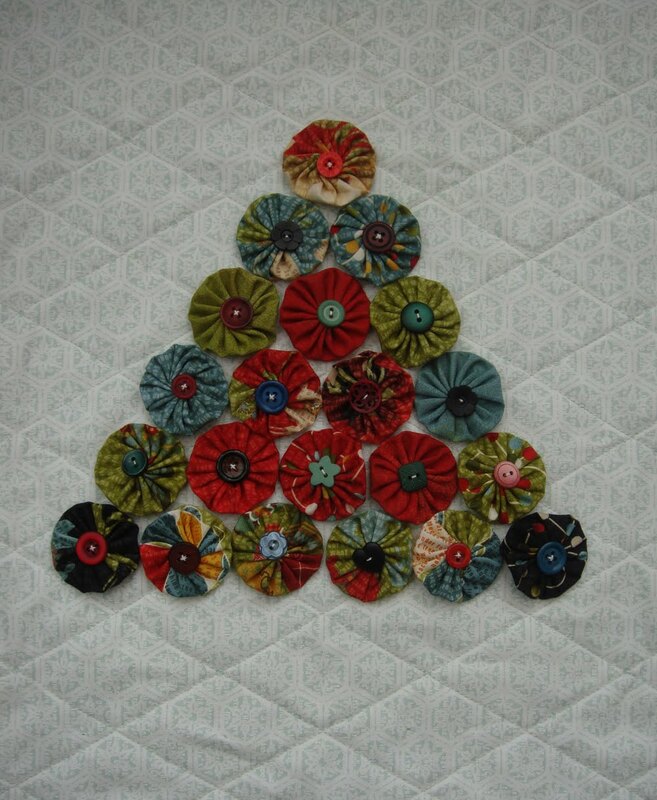 Makes one wall hanging 15″x17″ or you could make it into a pillow. We would love you to visit! This entry was posted in Charm Pack, Moderate, Seasonal and tagged Basic Grey, Christmas, Jovial.